The mission of SteadiShots.org is to educate and inspire its visitors. Whether they be professionals, amateurs, or simply an interested audience member, this is a place to learn about what actually goes into making the great entertainment we see in the theatres and on television. SteadiShots.org is a study of filmmaking on an individual shot level, focusing on the field of Steadicam operation. 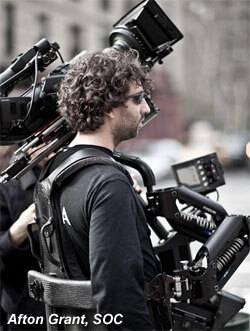 It was created by Afton Grant, SOC, a Steadicam owner and operator from New York. In listening to the conversations of other operators, it seemed as though shots, operators and productions were often discussed, but there was rarely actual footage to support the conversations. With a background in internet development, Afton set out to provide that resource. For those that do not know, the Steadicam* is actually a combination of several large pieces of equipment, worn on the operator's body that support the camera. The design of the equipment allows for the operator to walk and move about, without translating his or her footsteps or other vibrations into the lens, and subsequently the shot. There is plenty of information on the Internet about how the Steadicam works, how it is operated, and what it is like to be an operator. A simple search engine query will return thousands of results. SteadiShots.org is entirely non-profit. It invites collaboration and the exchange of information. It is an entirely free service to use. Revenue from advertising covers operating costs only. *"Steadicam" is actually a brand name trademarked by The Tiffen Corporation (www.tiffen.com). Today there are many other highly reputable manufacturers that make stabilization equipment to perform the same function. However, Steadicam being the first of its kind, its name has become synonymous with all brands of equipment in the industry.